Brochure produced by Halton Heritage Partnership. 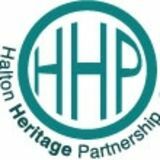 Visit www.haltonheritage.co.uk for online listings of Halton’s events. A fun, family day out to see the restored trains in action and a look round the engine shed. Locomotives Pixie and Norton Priory School will be hauling trains over the weekend. Talks, Walks and Family History Sunday 10th Sept, 10:00am - 4:00pm Catalyst Science Discovery Centre & Museum, Mersey Road, Widnes, WA8 0DF. Contact: info@catalyst.org.uk / 0151 420 1121 As well as the fascinating Family History Helpdesk, Catalyst’s Scientrific Gallery and the Birth of an Industry Gallery, there will be talks by Local Historian and Catalyst Trustee, Dr Diana Leitch MBE on the history of of soap making in Runcorn and Widnes at 10:30am and 1:30pm. At 11:30am and 2:30pm, Catalyst Trustee, Bob Roach will be giving guided ‘Heritage Walks’ of the local area incorporating Spike Island, Sankey Canal and West Bank. You can book your place on the talks and walks upon arrival. Wednesday 6th Sept 2017 5:00pm - 7:00pm Widnes Masonic Hall, Kingsway, Widnes, WA8 7QH. Contact: haltonheritage@gmail.com At 5:00pm the doors open to a one-night only, pop-up museum full of heritage exhibits curated by the Halton Heritage Partnership and friends. The pop-up museum will focus on the theme of ‘bridges and crossings’ in Halton’s development and members from the Partnership will be on-hand to talk you through their collections. Also, to mark their 300th anniversary, Widnes Freemasons will be hosting small group tours around the Masonic Hall and from 6pm a talk on the heritage of masonry will be delivered in the upstairs Lodge Room. An exciting display on the history of Widnes and the important role that bridges have played in it. There will also be talks on how a Freemason’s Lodge operates and building tours. Take the free shuttle bus from Norton Priory to Halton Castle and see astounding birds of prey, take part in family activities and find out about the latest archaeological digs. Friday 8th Sept, 6:30pm - 8:00pm Meet at the Hatton Arms’ car park, Hatton, Warrington, WA4 4DB Contact: chair@ddhg.org.uk A beautiful evening stroll to celebrate 100 years of change in Hatton. Over the course of 1.5 hours, find out how Hatton evolved over the century. Runcorn Archives Exhibition Friday 8th Sept, 7:00pm - 9:00pm & Saturday 9th Sept, 10:00am – 4:00pm St. John’s Church, Heath Road South, Weston, Runcorn, WA7 4LY Contact: alex.cowan@talktalk.net A curated exhibition on Runcorn’s history, Weston Village & its churches. Peruse historic photos of Hale Village through the years, or, if you’re feeling energetic, you can climb the tower before rewarding yourself with homemade cakes and scones. Historic Tours of St. Luke’s Parish Church and Village Saturday 9th Sept, 10:00am - 4:00pm St. Luke’s Church, Pit Lane, Farnworth, WA8 9HU Contact: barry.horabin@btinternet.com St. Luke’s Church has an extraordinary history, so come and explore! Grave records are on-hand to help you research your family tree, and from 11am to 2pm there will also be on-demand tours of the village. St. Peter’s Church Open Day Saturday 9th Sept, 10:00am - 4:00pm St Peter’s Church, Aston Lane, Sutton Weaver, Cheshire, WA7 3DB. Contact: jacky.hancock@btinternet.com / www.parishof.org The Church will be open all day and as part of this a talk with be given at 1pm by Philip Littlemore on the social historical context of the church. A wonderful chance to discuss the community’s favourite hymns, with 10 speakers sharing their best loved songs of worship. Places are limited. Contact Matthew on (01928) 592405 to book yours or to be a speaker. Halton Libraries Family History Information Day Saturday 9th Sept, 10:00am - 2:30pm Widnes Library, Victoria Road, Widnes, WA8 7QY. Halton Lea Library, Runcorn, WA7 2PF. Contact: haltonlea.library@halton.gov.uk / 0151 511 7744 If you’re interested in genealogy, take the first steps towards tracing your family tree by using your local library’s local history resources and Ancestry Online. This open days at Widnes and Halton Lea Libraries will show you how to get started, with our staff on hand with help and advice. The kids, meanwhile, can get hands-on and make their own family tree craft, so the whole family can have fun tracing their roots. 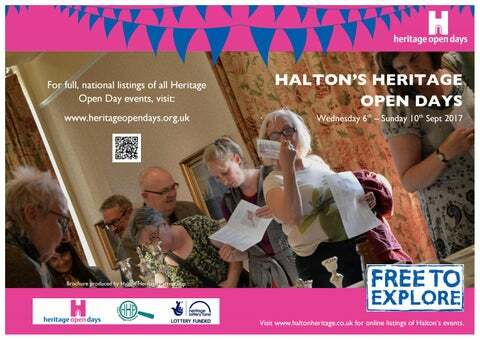 Listings of the Heritage Open Day events happening in Halton between Wednesday 6th and Sunday 10th September 2017.